OK, so the third floor is as solid as a rock. The FIRST floor is also solid and sturdy. So what the hell happened to the second floor? Did the builders just get lazy? 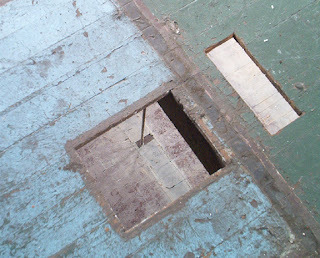 This is an image of the joists under the third floor, the stable one. The floor I'm standing on to take the picture bounces as I walk across it, enough to make a Yankee seasick. And of course, I have the 'heights' thing, so I'm constantly thinking I'm going to fall through and kill myself, at which point I know my husband will immediately make plans for building a large, (nay, massive) brick and stone outside grill monstrosity at the rear of the house, and I just can't have that, now can I? So we need to stabilize the second floor. 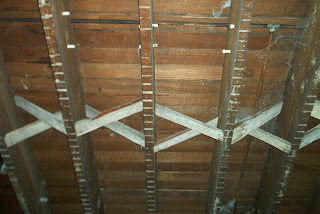 All of the original criss-cross joist braces in the picture above, are oddly missing on the underside of the second floor. I think we'll just add in 2x8" blocking, staggered by 8-10", and then, since we're not planning on having wood floors on the second floor, we'll just overlay the whole floor with 3/4" plywood or OSB and screw it to the subfloor. Update: We just bought a 90 degree drill attachment for the cordless drill to fit in between the roof joists, a 3/8" drill bit and a lot of 3/8" bolts to attach 2x8's to the sides of the joists for reinforcing (called "sistering"). The drill bit seems to work well in cutting through the joists, a lot easier than I was expecting, actually. I've heard stories about the old joists being close to petrified wood and going through a lot of drill bits. The only thing I wish was that we had taller ladders. Those joists are way up there and a tricky balancing act on two ladders holding up a 2x8. Something you may want to consider. Just a month late, $550 over budget and getting ready for the next step. In the image above, that's actually dumpster #2. It's smaller than the first one. There are more piles of wood and lathe in the back. There was a LOT of rubbish to come out of this house, a lot more than I expected. The good news is that the walls and the floors are just incredibly level and plumb. The maximum tilt to a wall is on the first floor, and it's off by 1/4". Geeze what ever shall we do? Heh heh. The carpeting is up on the first floor and we got our first real look at the original wood floors underneath. They look to be in very good shape, minus about 400 nail holes per room. We spent the last day bending over with hammer, crowbar & pliers trying to pull them all out. We know that we plan on sanding the floors down and trying to repair as much as we can (some small holes drilled for conduit, etc.) and that a single nail can ruin a disc sander's sandpaper wheels and at $5 bucks a pop, that's $20 per nail you missed. I think it's worth it to find them and pull them out. Unfortunately, in the dust, they're almost invisible. I have to swipe my feet from side to side over a patch of flooring, going all the way down the side of a wall, then turn around and sweep back about 2' over, eventually covering the entire floor. When my shoe snags, it's time to bend over and look for the little bugger. btw: We're not using a drum sander-- it's too hard and too potentially damaging to the floors. We'll be using the 4-rotary sander discs. 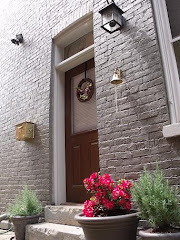 We saw it on "Ask This Old House." In this shot, looking from a hole in the third floor (the dark area is the joist under the third floor), you can see the hole in the second floor at the gas line that goes through to the first floor. Ah, the view..... But again, the floors are in good shape. Just a lot of lead paint to get scraped up. We're still trying to determine the best way to get the lead paint up, chemical paint removal, which keeps the toxic lead dust down to a null amount, -- or sanding, which scatters the cr@p everywhere, requires full tyvex suits and lead rated dust masks (i.e. respirators), but may be easier. We'll let you know how it goes. I think there's a coin toss in my future. ...any medical procedure whose purpose is to prevent, rather than treat or cure, disease. Today, we visited my old friend Dr. Tony Brown ( www.doctortonybrown.com ) for a little prophylactic treatment. No, not that that type! It is generally recommended that if you're going to be working on a rehab that you get a tetanus shot. It's almost assured that there's going to be a rusty nail injury somewhere along the way. If this were to happen on a weekend, then we might be dealing with an ER tetanus shot. Why worry about that? For the price of a couple bottles of wine, we can update our tetanus protection and deal with most minor injuries in our own time or simply on our own. This was a tip I got from the Newell Brother's book on rehabbing brick buildings. I'd say it's a pretty good one. Besides, we don't want to end up like John Roebling, do we? You need to contact Concrete Fastening Systems. Period. Home Depot carries Tapcons (the alternative to using a Ramset to attach 2x4s to concrete, brick or masonry) but at a cost of $.20-$.25 cents each, and in two different stores I went to, they only sold them in boxes of 75, and they didn't have them in the length we need for our project. In general, you add the depth of materials you are fastening to your concrete/brick/masonry and add 1" for penetration into the surface. (We, by the way, will be going overboard and also caulking the 2x4 furring boards to the surface before drilling for the Tapcons.) In our case, we have .5" of plaster and 1.5" of lumber to attach to our brick exterior walls. This means we'll be using a minimum 3" Tapcon. We found them in 3 1/4". We chose the 3/16" flathead screws so we wouldn't have to worry about the hex caps messing with the drywall we'll be laying over top. So why go to Concrete Fastening Systems (in Cleveland, OH) or online at www.confast.com? Because my 3/16" x 3-1/4" Flat phillips head Tapcons cost me only TEN CENTS EACH. And here's the kicker: I ordered them on Tuesday. They arrived Wednesday afternoon. Shipping was about $11. And there was a bright and shiny new drill bit in each and every box, Free. Fast and cheap. Gotta love 'em. So spread the word... Our demolition contractor said he used a Ramset because Tapcons were too expensive. Heh. Not any more. Okay, after a quick look at the kitchen (the main focus of our home) we noticed that with the second sink in the island, we were still going to have problems if the sink wasn't big enough to hold a colander or deep enough to fill a pot with water... hence a bigger island sink is needed. Also, since the butcher block counter top will be actively used for chopping, what I wanted was a quick receptacle for chop-scraps. We do a lot of chopping and trimming, so the idea is to have a small place to quickly clear the cutting board. At first, we thought we'd want to have a regular garbage can under the butcher block, but raw food cuttings are usually something you don't want to stick around until the garbage gets full. It would most definitely start to smell badly. So, we decided, a small receptacle that could be emptied to the larger garbage can on a daily basis would be best. We recently ran by the old industrial kitchen standard steam pans (see here) and thought that would make an excellent short term rubbish bin. With slide clips to the underside of the butcher block, we can slide it in and out, keeping it tight against the underside of the block. We'll cut the block out as a keystone. Angle the cut block into a wedge so that to open it, all we'll need to do is reach under the block and push it upwards and pop it out. That way it will be smooth when inserted into the block because it won't have a knob or a lever on the top & won't have a lip to hold gunk. Viola. We'll need to make a backup in case we lose one, but I think it'll work. I'll let you know. Better ideas are welcomed!! Where is the house at now? 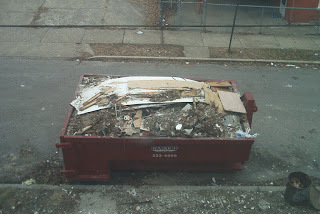 We're finishing up the demolition work and we're on to our second dumpster. Most of the non-structural walls are down, trim boards are off, ceilings and drywall are gone. Once the old stacks are taken down and the leftover debris removed, we'll be on to the framing and *furring* out of the walls. It sounds cuter that it seems, trust me.